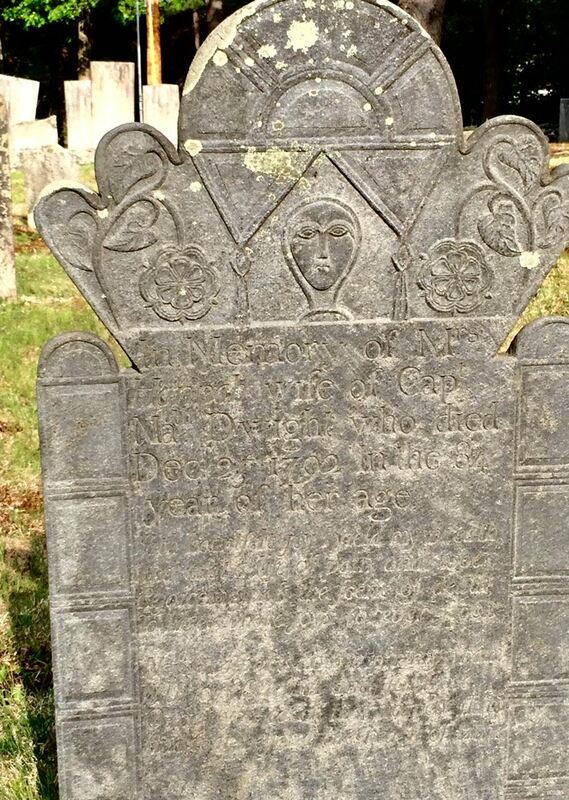 If you have ever strolled through Black Point Cemetery in Scarborough or in the graveyard next to the Harrington Meeting House in Bristol, chances are that you have seen the work of headstone carver Joseph Sikes. The spoon-shaped faces, half-circle eyes and stylized manes of hair of the deceased are unmistakable and the work is recognized as colonial art. At a time when the winged angel was a standard choice for headstone design, Joseph and his son, Elijah, created their unique work featuring the face of the deceased on the headstone, encircled with ivy vines, whorling rosettes, hearts, stars or moons. Occasionally the Sikes would include a winged cherub, a popular symbol at the time. The words Memento Mori, Remember Death, grace many of these stone carvings. Joseph Sikes was born in Springfield, Massachusetts in 1743 to a family found among the first settlers of the Connecticut River valley. After he married Eunice Smith in 1769, Joseph moved to Belchertown, Massachusetts and that became the center of his work for the next two decades. Gravestones attributed to Joseph and his son, Elijah (born 1772), can be found as far south as Plainfield and Brooklyn, Connecticut. Many of these stones are extremely well-preserved and the ornate vines and rosettes are beautiful. The exact dates of Joseph Sikes’ removal to Maine are unclear, but mostly likely occurred in the 1790s. His son Elijah married in 1794 and migrated first to Berkshire, Massachusetts then to Vermont, where he bought a stone quarry. Elijah and family eventually went further west to Trumbull, Ohio, where he continued to carve gravestones but in a different style. The majority of Sikes’ gravestone carvers can be found in Cumberland County. Black Point Cemetery in Scarborough has several well-preserved examples of his work, including the lion-like mane of hair surrounding the face on the grave of Hannah Libby. His choice of stone, schist, unfortunately does not stand up well to the ravages of time, unlike some of the stones he produced in Massachusetts. In Portland, look for the headstone of William Frost in the Stroudwater Burying Ground and that of Sarah Simonton, in South Portland’s Mount Pleasant Cemetery. Gorham. Sikes apparently moved north from Scarborough to the area of Bristol, Maine. His son, Arthur, lived nearby in Lincoln County’s Balltown Plantation, which became part of Whitefield and Jefferson. Bristol includes the historic Harrington Meeting House, built in 1793, and the adjoining graveyard where you can find another half-dozen Sikes’ grave carvings. Look for the distinct headdress on the portrait of Mary Hatch, who died at age 19 in 1797, as well as markers of Hannah Hatch and Samuel Lermond, who died at age one in 1796. Despite his prolific career creating memorial headstones throughout New England, the whereabouts of Joseph Sikes gravesite remains a mystery. He was reported to have died in 1802. By the 1800s, the family changed the spelling of their last name to Sykes. Joseph Sykes granddaughter, and my 2nd great-grandmother, Sarah Sykes, was born in 1819 in Newcastle. If you have any clues to where Joseph Sikes is buried, please contact us! 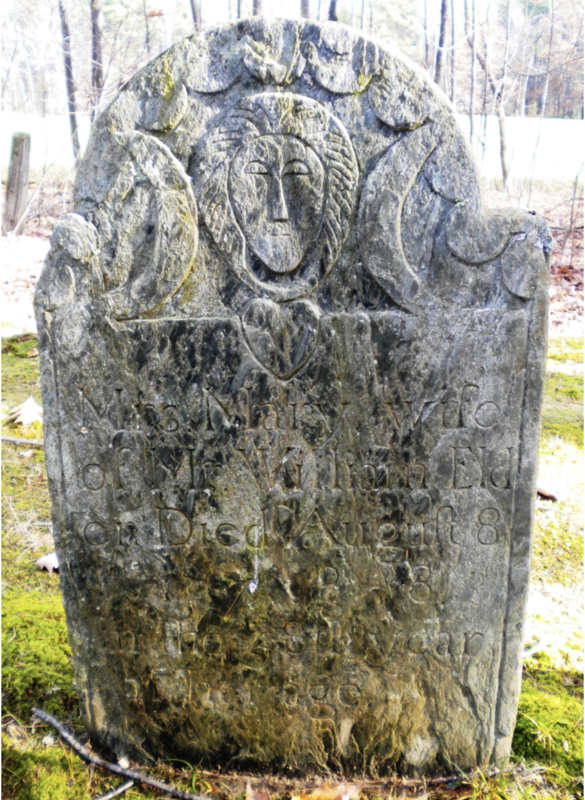 For more on Joseph Sikes and other early gravestone carvers in Cumberland County see Giguere, Joy, "Death and Commemoration on the Frontier: An Archaeological Analysis of Early Gravestones in Cumberland County, Maine" (2005). Electronic Theses and Dissertations. Paper 1041. 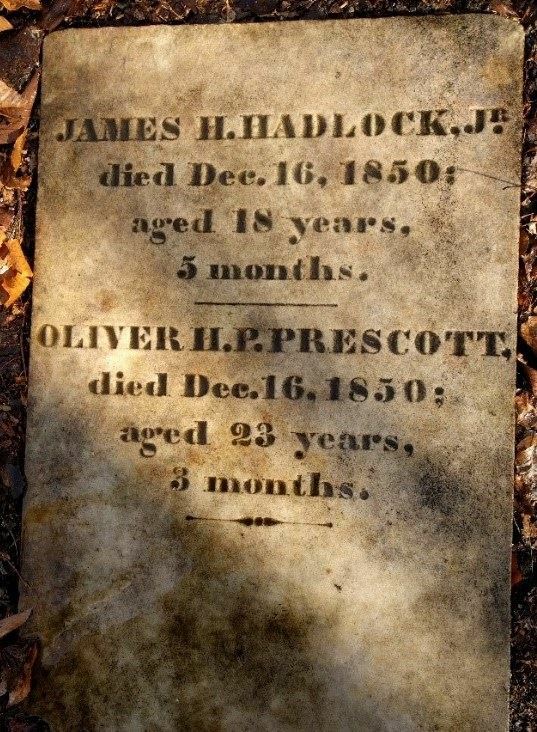 This gravestone of two young men who died on the same day in 1850 was photographed in the Old Garland Cemetery on the Gary Moore Road in Ellsworth by David and Ellen Simmons. What's Under Your Back Porch? The College* has been rebuilding its simple, elegant but rickety porches at a steady clip for a number of years. The front porch of North House was rebuilt in the nick of time last summer. This summer the front porch of Kane Hall and the narrow, old back porch of North House got the same treatment. They are a sideshow to the huge renovation going on at Hamilton and Jefferson. No costly, mind-boggling code issues on porches; no permits, no real deadlines. The work is being done by crews from the St. Johnsbury correctional facility, supervised teams who do construction jobs for Northeast Kingdom non-profits. These teams have been the College's painters and carpenters for four years now, saving the College lots of money and earning a day off a sentence for each day of work, as well as some pay. On June 21, with the rotted North House back porch ripped out and its roof propped up with 2 X IOS, one man's shovel hit a stone that turned into a story about a child without record, who died almost exactly 185 years ago, and about the broken gravestone that the work crew pried up and laid out on the lawn. Cleaned of dirt and mud, Horace Nelson's stone took a position in the President's office in Mager Hall, on the corner of the table where everyone could get a good look at it. Especially Dave Linck, who is as close to being Craftsbury's official historian as the village is likely to get. "Oh, yes. Very nice," He said upon seeing the marker. "But who? Who exactly is this?" That rhetorical question was followed by a not too brief description of various Nelsons and Powells, including one who apparently "accidentally" shot his wife while cleaning his pistol in 1875. Micki Martin devoted herself to transcribing the epitaph, some letters almost entirely obscured, and comparing the couplet to similar ones from the late 18th and early 19th Centuries. And Farley Brown, after joining Dave Linck and others in another round of story making over the stone, headed down to the Town Clerk's office to see if any records of North House or of the Common circa 1826 mentioned Horace Nelson Powell, age 10 months. Dave Linck chose to re-examine a few Craftsbury graveyards. In the meantime, something else turned up. Bones. One deer leg bone (everyone agreed) and two funny looking bones, thin walled, five inches long, almost fluted in shape, and with their internal bony filament partially intact. Is this a graveyard? Is the back of North House an early 19th Century boneyard? If it were, what then? Would the state anthropologist halt the rebuilding of the porch and initiate a real dig? How great would that be? There was already a blue rain tarp over the site, giving it a certain air of protection and importance. And there was much interest in probing the next layer down, which appeared to be a circular brick structure, capped with a slab of slate, and apparently once connected to North House cellar by a length of lead pipe. It was curious, too, that the known history of North House includes three generations of morticians, beginning with James Wellington Stevens (d. 1870), then his son Henry, followed by a nephew, Henry Clapp, whose family owned the house until 1968 when it was sold to Sterling School. It happens that the current resident of North House is a direct descendent of patriarch Roger Clapp, of the 17th Century Clapp family of Dorchester, Massachusetts, and whose gravestone is secure in the King's Chapel cemetery in Boston. In any case, by the next morning the circular brick structure turned out to be an old backyard grey water sink, made with relatively modern brick (Drury brand), with some old slate holding it together, and filled now with dirt and mud. The headstone itself was receiving a steady flow of curious community members from inside and outside the College. In most cases, this happened: First they would read the words and then touch them— such an engraved object, laid out, seemed to compel people to lay down their hands flat on it—then everything would stop for just a moment, snagged on Aged 10 Months. There are other anomalies: The first two lines—Horace Nelson/Son of Francis—are slightly off-kilter, as if the engraver forgot to start each letter on the line. And the top of the stone, where a few decorative elements appear, has been removed, sawn off by the appearance of the marks. One guess is three-quarters of an inch are missing, that would have made the entire stone exactly 12 X 24 inches. What do these clues mean? Was this the engraver's first stone, and he made so many errors it was angrily rejected and tossed aside? Or perhaps it was the father who tried to engrave the stone, inexpertly and while grieving, and it was unusable. Maybe an illiterate engraver was following the script of another illiterate person, and then someone came along and corrected him and he inserted the correct letters. Everyone made up a story, or at least a story fragment, like the stone itself. It seemed as important as touching the stone, closing some loop in how we think about children and death and times so remote as to be hardly imaginable even with the aid of found objects. But even if every story is as legitimate as the next one, if the stone was rejected, where's its replacement? Where is the child buried? Not in any of the nearby cemeteries, said Dave Linck. He knows of a child's headstone down in the village set all by itself in a backyard. And he knows of two children whose deaths are reported in town records, but whose burial sites are lost. It would have helped had Dave Linck been able to find Horace Nelson Powell's parents or grandparents. Instead, in the cemetery on Cemetery Road, Dave identified a person he believes was the child's younger brother, born in 1828 and who lived a long life and was buried in 1905. It was this man who shot his wife. Then, after comparing the bones discovered near the headstone to the articulated human skeleton owned by Craftsbury Academy, and after consulting with his anthropologist brother, Dave reported that these were not human bones. No one was disappointed at this news. Still and all, none of this explains or even suggests an idea of how the stone came to be buried under the North House porch. The workers who uncovered the pieces reported the largest piece, practically the entire stone that would have stood above ground, was about four feet from the back door, buried a foot or 18 inches deep, engraved side down, and at a slight pitch, maybe 10 degrees. Farley Brown discovered nothing in the town records of a Horace Nelson Powell, or of a child's death in early fall of 1826. Exactly when North House was built is not clear, but Farley's examination of village documents indicated that the current structure was there by 1850, and that there was certainly some kind of structure on that site as early as 1825, and it could have been the current building, or not. When the back porch was added is also not known, nor is there any evidence indicating whether the porch just rebuilt was original or just one of many over the years. Dave Rowell, a local real estate broker, justice of the peace, and live radio performer for 15 minutes a day with the WDEV Radio Rangers, tells one story that may shed light on how the stone came to lie under the North House porch, or at least how gravestones sometimes wander. Dave Rowell's sister, Margaret, had for years owned the upper half of Samuel Crafts' headstone. The son of Ebenezer Crafts, considered the town's founder, Samuel became an early governor of Vermont. He died in 1853 at age 85; his wife Eunice in 1828; and their son Samuel was born... but the break in the stone occurs there. Town records and history account for the child, however. During a long drought around 1998, Margaret Rowell wanted to find a new spring above her cabin - the old Spaulding property just up the hill from Craftsbury village. Competing dousers identified two spots; the first didn't work out. The second did, sort of. "After a bit of digging," Margaret said, "he found the actual headstone of Samuel and Eunice Crafts. It was in remarkable shape, but broken off at the bottom." Some years later, Dave and Margaret were talking about how her half gravestone was white marble when they noticed they were standing on top of a piece of white marble in the dooryard. It had been there for many years, part of a stone walkway. Dave flipped it over and it turned out to be the missing portion of the Crafts stone, which is four or five times larger than the baby Powell's stone. The Crafts marble monument (C. 1905) sits in the main cemetery on the Common. The speculation is the more formal and elaborate monument replaced the original stone, and it found itself on the Spaulding property in pieces that may have been apart for 100 years or more. But for our stone one story really is as good as another. Take your pick. To me, at North House with its new porches front and back, covering up for generations whatever else might lie buried under them, there is meaning in discovering a life long disappeared and unimagined. No paper work. No memory. No family bible hinting at this short-lived pioneer. Just an ill-carved stone, misused, dug up, displayed, but testimony, still, to a life returned to place and to imagination. * Reprinted with permission from the fall/winter 2011 issue of CommonVoice, a publication of Sterling College, Craftsbury Common, VT. I believe there is nothing morbid about visiting the old cemetery, and I always do so when I walk up East Ridge Road in Cooper, Maine. On this particular winter day there is no snow on top of the frozen ground, and I crunch my way easily to two graves in the back row. They are always easy to find because of the two small American flags set in front of them. Today is so still, and no cold wind moves the tree branches or waves the little flags. The smaller gravestone has a very brief epitaph of “J.R. Higgins, CO. F 6th ME INF.” The tall gravestone has much more information and reads: “John H. Smith, Died July 10, 1866, AE 21 years. 1 ms, member of the Co. 1, 12th ME Reg.” Here are the graves of two men from Maine who were involved in the Civil War, a terrible time of crisis for our country long ago. The United States was almost torn in two by a conflagration ignited by Americans fighting Americans. Who were J.R. Higgins and John H. Smith? Did they volunteer or were they drafted to fight to save the Union their grandfathers had founded? Did they light for honor and duty? Or might they have wanted adventure and a chance to leave the everyday life of Downeast Maine? Did they hope to gain glory or to find monetary opportunity? Did they have families? Were they fishermen or farmers or storekeepers or teachers or lumberjacks? Perhaps both men were among those incredible people who called forth inner courage to go to war because it seemed the right thing to do. They would leave their Maine friends and families to fight for the Union and to abolish slavery in the name of humanity. It may seem strange that I always feel sadness for these two men who died so long ago. John H. Smith died soon after he returned home to Cooper. And he was not quite 22 years old. I did some research about the lives of Higgins and Smith and learned that their deaths and others left a profound legacy in Maine. Maine had one of the highest percentages of men who served in the Union Army of any state in the nation. It is documented that Maine lost one of every five men. However, they did not all die in combat. J .R. Higgins was in Company F of the 6th Maine Infantry Regiment. John Smith served in Company I of the 12th Maine Infantry Regiment. The actual statistics of the 6th and 12th Regiments state that 3 officers and 49 men were killed and/or mortally wounded and 2 officers and 237 men died of disease in the 12th. Twelve officers and 141 men were killed/mortally wounded and 2 officers and 100 men died of disease in the 6th. The living conditions of the camps were terrible, and all sorts of diseases were common. Also soldiers were more afraid of dying from infections they got in the poorly equipped hospitals than from combat wounds. Men such as John H. Smith of Cooper sometimes tragically died from wounds, or illnesses, after the war was over and they returned home. Men and women as well must have experienced days of boredom and anxiety waiting to go into battle. The excitement, enthusiasm and passion for the cause could have waned while they waited in drafty tents and cold and muddy trenches. Higgins and Smith and many others were Mainers and probably proud of it. But like all of their fellow soldiers, they had to put that loyalty aside in order to become part of a much larger army that had to follow orders, function and be united in the chaos of the battle. Most soldiers were in the infantry and had to walk and march long distances. Their boots and shoes would wear out and they became footsore and weary. But soldiers endured because it was their duty. A soldier also had to endure the madness of war itself. The screams of cannonballs dying over them and the descending whine when they came down and thundered into the ground was never taken for granted. There was often no place to seek shelter and they could be horribly blown to bits. They would hear the loud whiz of bullets and musket balls and the whoosh of deadly shrapnel. They would smell smoke, gunpowder, blood, sweat and even fear. Soldiers sometimes had to walk or run right over the bodies of wounded and dead soldiers and ignore their pain and suffering in order to save their own lives. You would probably never forget such experiences. If you saw blasted battlefields that were once crop fields and shattered buildings that were once homes and towns, you would have had to know that human lives were ruined as well. I wonder if men like Smith and Higgins has such experiences and memories. In April 2011 the United States began sesquicentennial recognition of The War Between the States/The American Civil War. All over America people can honor and remember the men and women who served in the War from both North and South. They can visit graves and battlefields and monuments. In a park in Calais there is a bronze soldier standing atop a red granite monument. He confidently holds a rifle across his chest and wears the uniform and cap of a Union soldier. The plaque below him states this was erected in 1893: “In Grateful Remembrance Of/The Men of Calais/Who Upon Land and Sea Sacrificed Their/Lives That The Nation Might Be Preserved/And That Government Of The People/By The People And For The People Should/Not Perish From The Earth/ 1861-1865.” Calais citizens remembered and desired to have future generations do the same thing. There are many such moments in Maine and other places in our nation that honor people. I, too, understand how important it is to celebrate the contributions of people, and not war itself. So I will continue to visit the graves of Higgins and Smith. Charles Kuralt once said: “The reality of any place is what its people remember of it.” I will always admire and respect the caretakers of the East Ridge Cemetery in Cooper who still place all those small American flags near their graves. Let all of us remember. Published 2013 Discover Maine. Reprinted with permission of the author. Where O Where Goeth Hannah Ware? The Present: In 2016, when it was time to make his next move, our protector of tombstones was pretty sure that by holding onto her stone, Hannah was somehow jinxing his house sale prospects. The headstone needed to go. Here’s where I came in, offering to take custody of the stone to try and find its rightful home. Of course, back in 1964, that would have been a daunting task for Hannah’s finder. 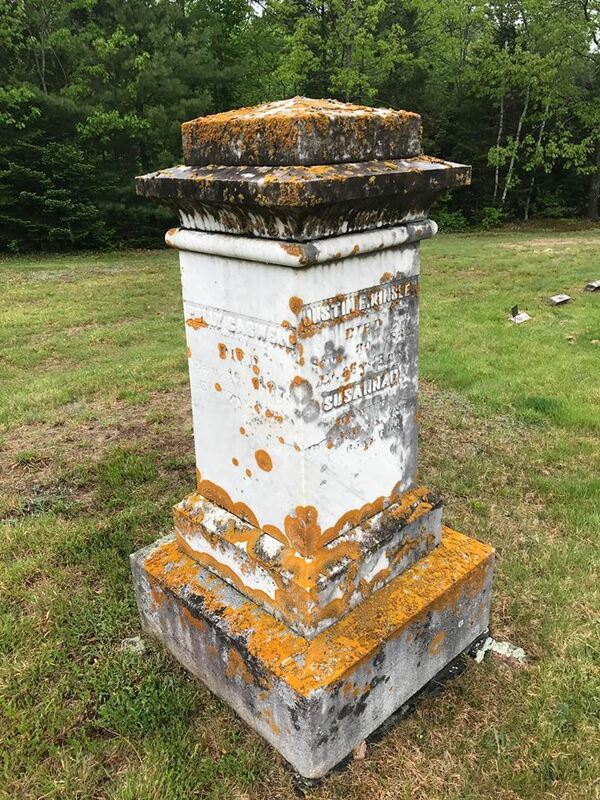 Like Maine, rural Massachusetts is littered with cemeteries large and small, and there were few resources then for searching cemetery records unless you had some hint where the family lived or died and a lot of time on your hands. But today, with online inventories like Find A Grave and Ancestry.com, the process took just a few minutes -- less than the time it took the wet slate to dry after being rinsed off on my front porch on a warm September day, to be precise. By searching on Find A Grave for Captain Joseph Ware, I quickly located his grave, complete with photo, in Old South Cemetery, Sherborn, Massachusetts, several miles west of where Hannah’s stone was found by the side of the road in 1964. 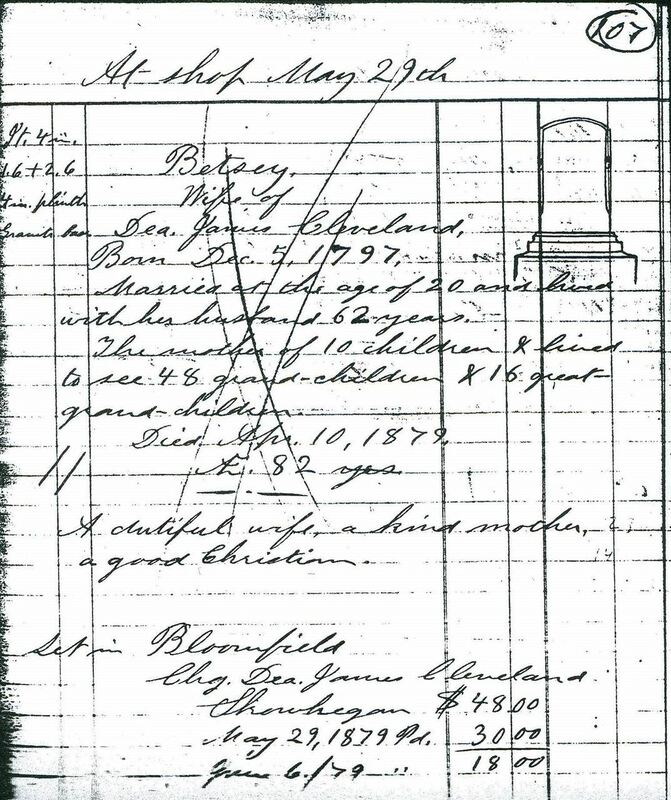 There is a burial record there for Hannah as well, but of course no stone, though the stone does exist in a 1905 inventory available online through the Sherborn Library. Not surprisingly, Hannah's stone appears to be in much better shape than the Captain’s. Nevertheless, except for the names, the stones are identical, clearly executed by the same carver, with the same winged death head depicting a grim human face rather than a skull, and the reference in the inscription to ye. Memorable Mortality (this unusual phrase refers to a deadly plague that swept through the area in the early 1750's, causing severe respiratory symptoms and wiping out a large percentage of the population). Intrigued, I contacted the only person I knew who might have the 2-volume “bible” for researching this sort of thing (Jim Blachowicz’s From Slate to Marble 1770 – 1870: Gravestone Carving Traditions in Eastern Massachusetts), Ron Romano, of course! He noodled around a bit without much luck – that winged face was odd -- deliberately primitive in a stone that had no other primitive features. 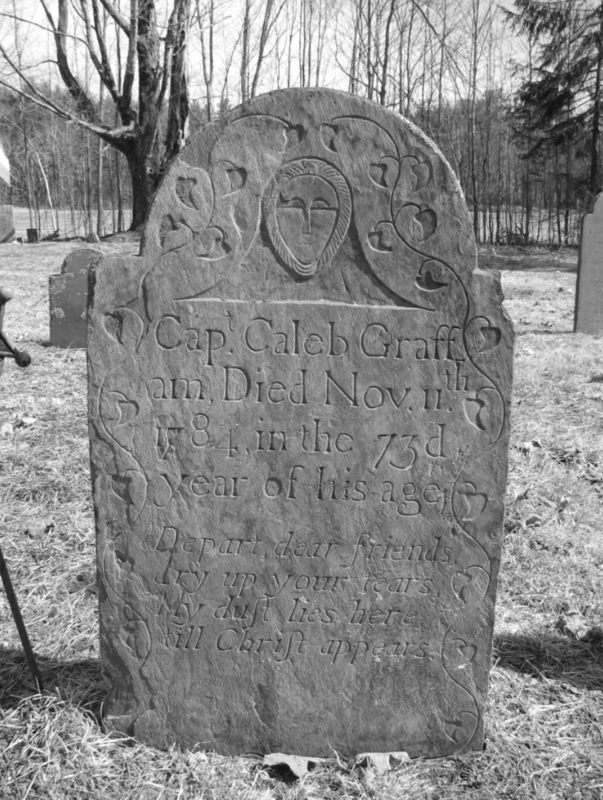 So Ron directed me to the Farber Gravestone Collection, a fascinating online archive of over 13,500 images of historic New England gravestones, indexed by numerous characteristics, stone type, date, location, carver, etc., for further noodling on my own. Provenance: My first attempt was to search for Slate, Massachusetts, winged face. That narrowed the field to 2,192 -- considerably fewer than 13,500, but still too many thumbnail images for browsing. Then I took a chance that maybe the carver was just goofing around with this style in 1754 (see alternative theory below on this subject). That narrowed the crowd to 15! From the other images of the Solomon Park stone, I could see that the border carving on the sides was different, but the lettering style, numbers, wording were all very close. Same shop if not same carver. So once I had the carver’s name, I searched the Farber Gravestone Collection again and found a total of 125 images of John New’s work. Browsing through those images revealed all of the components on Hannah’s stone -- including some fabulous lettering! New worked in the Sherborn area for just a few years, coinciding with the Memorable Mortality, but he was the only carver of the time (whose work is illustrated in the Farber Collection) to use that distinctive, haunting face, depicting a chain-like collar below the mouth. Based on the Farber images, the winged face with the choke-collar only appears on stones from 1749 - 1761, when the plague was raging through Massachusetts, while examples of much more elaborate heads, cherubs, etc, appear on his work throughout the entire range of his career, 1742 - 1785. Of particular interest is the stone he carved for James Eager’s wife Tabitha (shown below), who died just a few months before James in 1755. Atop the angel’s wings on Tabitha’s stone is a neatly carved portrait head. Above the same wings on James’ stone is the choke-collared skull. 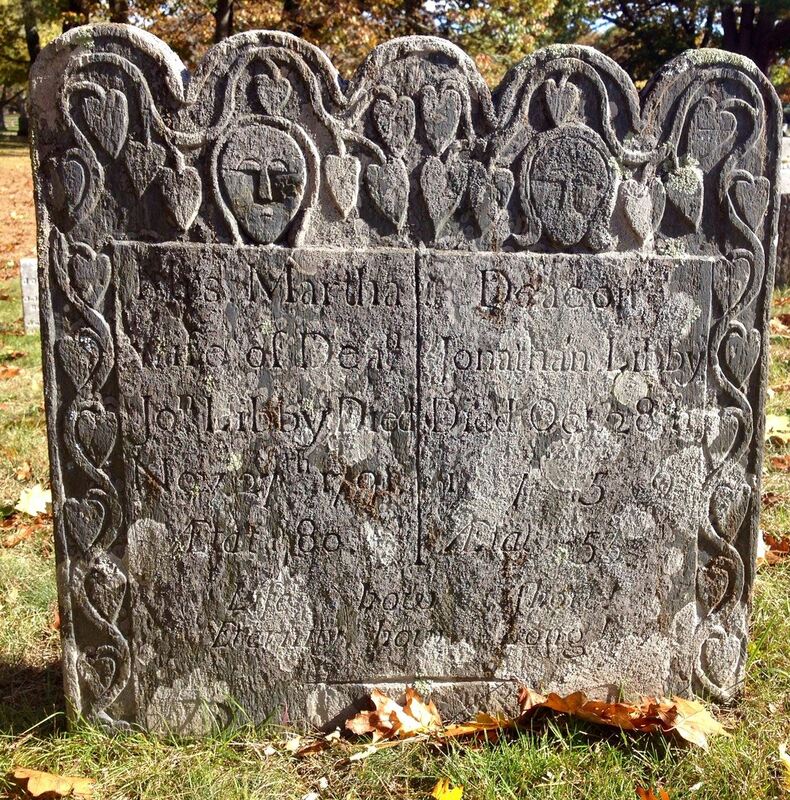 For an in-depth look at John New’s career and life, see Vincent F. Luti’s scholarly article, “Eighteenth Century Gravestone Carvers of the Narragansett Basin: John and James New.”>1 In it, Luti refers to the winged head on stones like Hannah’s as a “third-rate skull,” which it was, but unlike Luti, I do not believe it was simply a step in New’s development as a carver. I have a different hypothesis. In “The Pursuit of a Pestilence,”2 Ernest Caulfield described the epidemic which swept through Massachusetts in the early 1750’s known as the Memorable Mortality, as a deadly flu-like "pleuritic fever" which spread rapidly, causing respiratory infections that literally strangled its victims, killing them in just a few days. New was a skilled carver. He knew perfectly well how to execute an elaborate skull or face, winged or otherwise, as evidenced by the other stones he was carving during the same period when he was also using the “third-rate skull.” Without knowledge of who the specific victims of the Memorable Mortality were, we cannot be sure, but it seems more plausible that New used that particular face for its victims, like Hannah and Capt. Joseph Ware. Their stones and a few others in the area also bore the 31-character phrase, “Died in ye. Memorable Mortality.” But at the time, using the choked skull would have conveyed the same message to survivors in the know. Hannah Ware’s Prospects: Obviously, when I contacted Town officials in Sherborn about the recovery of Hannah Ware’s stone and my plans to deliver it to them this summer, they were ecstatic. 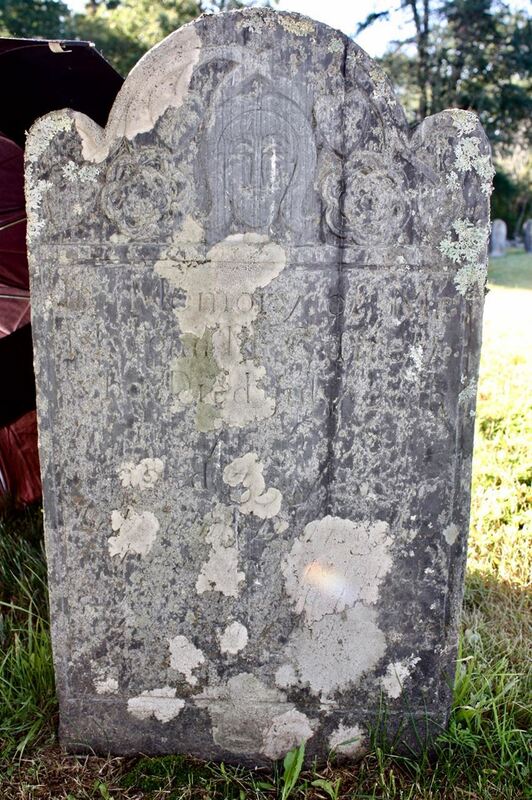 From my perspective as someone who has spent a fair amount of time involved in cemetery preservation efforts, there was really only one question left to be answered – what will Sherborn do with the stone, once it is returned? Fortunately, they responded with the “right” answer -- Sherborn has a restoration fund for damaged historic stones like Hannah’s. So before returning it to its rightful place next to Cap. Joseph in Old South Cemetery, the stone will be “professionally restored.” It’s their stone and their Town history. So I’m trying really hard not to ask just what that means. By the way, the week after Hannah’s headstone left his house, my friend received two offers and sold it. 1 Luti, Vincent F. “Eighteenth Century Gravestone Carvers of the Narragansett Basin: John and James New.” Markers XVI (1999): 6-103. 2 Caulfield, Ernest. “The Pursuit of a Pestilence.” Paper presented to the American Antiquarian Society. http://www.americanantiquarian.org/proceedings/44807204.pdf. Also an Infant, also two Infants. These words or variations thereof appear often on grave markers in Maine’s old cemeteries. The stone for Julia Ann Pierce Sanborn, who was born in May of 1812, is in Chesterville ME’s Center Cemetery. On 10 Sept. 1835 Julia Ann Pierce married Amzi Sanborn as his first wife.1 Amzi was supposedly an 1832 graduate of N. Y.’s College of Physicians and Surgeons,2 and his stone is next to that of Julia Ann. Amzi, the son of John and Hannah Bachelder Sanborn, was born 1 Jan. 1809 in Parsonfield, ME and died of consumption in Phillips, ME 3 on 9 Nov. 1861.4 Julia Ann Sanborn died on 13 Nov. 1852 and near the bottom of her marble stone there is a recessed area with three hands, each of which has a finger pointing toward heaven. 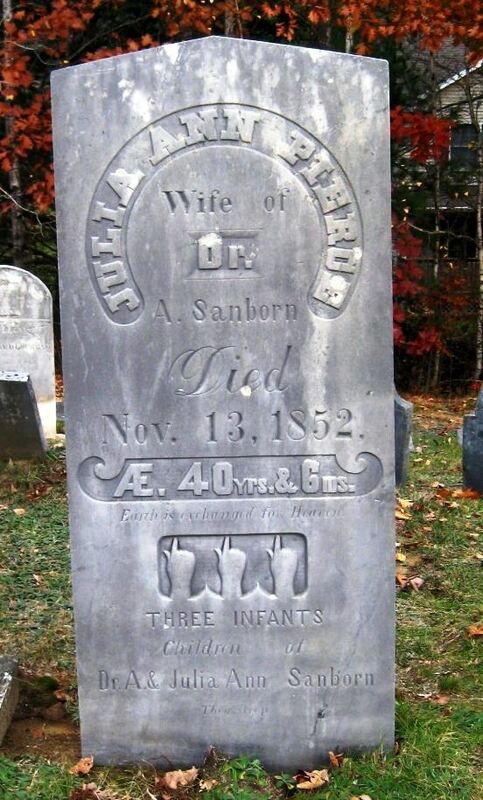 Below the hands, written in stone you see “THREE INFANTS/Children of/ Dr. A.& Julia A. Sanborn/They sleep.”.5 Who were these infants? After graduation Dr. Sanborn moved to Chesterville, ME where he and Julia Ann Pierce were married on 10 Sep. 1835.6,7 In 1836 they spent about a year in Bucryus, Ohio and then traveled “in his own carriage … through much of the western country”. When Dr. Sanborn’s health improved they settled in West Dedham, MA where he practiced for several years before returning to ME.8 On-line searches for Amzi and Julia Ann Sanborn’s children who might have been born in Ohio or MA have not located any children for the couple. Six children were born to Amzi and Julia Ann Sanborn.9 The children for whom names are known were Ellen Angeline (1836-1904)10, Juliette Caroline (1839-1840), Marshman Williams (1841-1884) and Edward W. Talbot (1845-1886).11 One of the hands carved on Julia Ann’s gravestone is likely for Juliette Caroline, but what were the names and dates of birth and death for the other two infants? A quest to find the names of the three infants for whom hands are shown on Julia Ann’s gravestone turned up the name of only one, Juliette Caroline (1839-1840). What were the names for Amzi and Julia Ann’s two “name unknown” infants or the name of the infant son of Amzi and Mary? 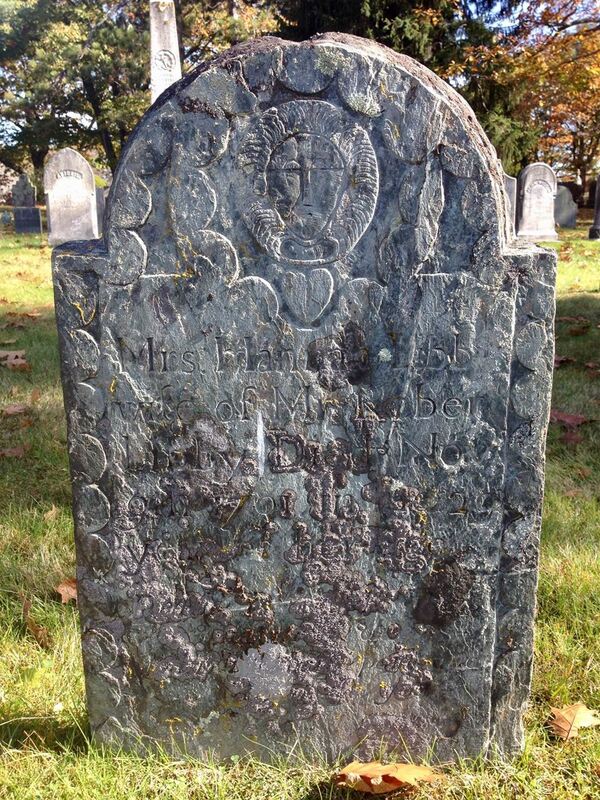 There are many INFANTS in Maine’s old cemeteries who might never be known by name, but those lucky enough to have an existent gravestone will be remembered. 2. Dearborn, J. W. (Jeremiah Wadeigh), A History of the First Century of the Town of Parsonsfield, Maine. Incorporated Aug. 29, 1785, and Celebrated with Impressive Ceremonies at North Parsonsfield, August 29, 1885 (Portland, ME., B. Thurston & Company, 1888), 148. [Hereafter History of Parsonfield, ME] Note that Catalogue of the Alumni, Officers and Fellows, of College of Physicians and Surgeons in the City of New York from A. D. 1807, to A. D. 1865 (New York, Baker and Goodwin, 1866) 48, 49 lwhich lists the class of 1832 does NOT list the name of Amzi Sanborn. 3. History of Parsonfield, ME, 148. 4. Dr. Amzi Sanborn gravestone, Center Cemetery, Chesterville, ME. Photographed by Cheryl Willis Patten, 22 Oct. 2016. 5. Julia Ann Pierce, wife of Dr. A. Sanborn gravestone, Center Cemetery, Chesterville, ME. Photographed by Cheryl Willis Patten, 22 Oct. 2016. 6. History of Parsonfield, ME. 148. 8. History of Parsonfield, ME. 148. 12. Year: 1840; Census Place: Chesterville, Franklin, Maine; Roll: 140; Page: 55; Image: 115; Family History Library Film: 0009703. 14. Find A Grave Memorial 118735752, Mary Wheeler Sanborn, Evergreen Cemetery, Phillips, ME. 15. Year: 1860; Census Place: Phillips, Franklin, Maine; Roll: M653_435; Page: 1069; Image: 484; Family History Library Film: 803435. 16. Year: 1870; Census Place: Phillips, Franklin, Maine; Roll: M593_543; Page: 160B; Image: 190319; Family History Library Film: 552042. 17. Find A Grave Memorial 118735752, Mary Wheeler Sanborn, Evergreen Cemetery, Phillips, ME. 18. Find a Grave Memorial 118735733, Sanborn Infant, Evergreen Cemetery, Phillips, ME. Betsey’s gravestone in Skowhegan’s Southside Cemetery makes it clear that family was important to her. How proud she and James must have been that their descendants were noted citizens in far flung places, including many U. S. states and Australia. 1 Maine Old Cemetery Association. The Marble Records, “Betsey Cleveland”, (No place, privately published, 2006). Volume 19, Page 107. 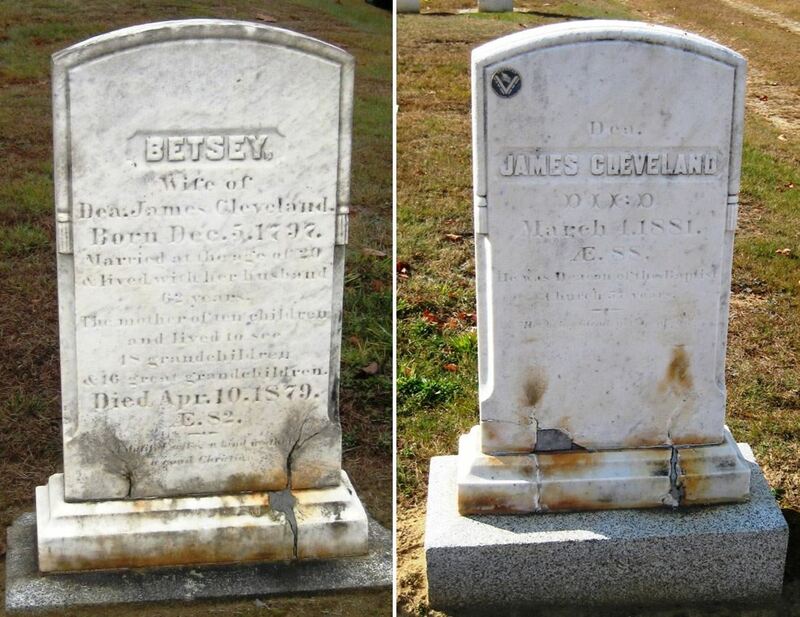 2 Betsey Cleveland gravestone, Southside Cemetery, Skowhegan, ME. Photographed by Cheryl Willis Patten, 22 Oct. 2014. 3 Louise Helen Coburn and other residents, Skowhegan on the Kennebec, 2 volumes (Skowhegan, Maine, 1941), 1:178. 4 Coburn, Skowhegan on the Kennebec, 1:178. 5 Coburn, Skowhegan on the Kennebec, 1:178. 6 James, The Cleveland Genealogy, II: 1751. 7 James, The Cleveland Genealogy, II: 1708. 8 James, The Cleveland Genealogy, II: 1709. 9 James, The Cleveland Genealogy, II: 1709. 10 James, The Cleveland Genealogy, II: 1710. 11 John E. Cleveland gravestone, Southside Cemetery, Skowhegan, ME. Photographed by Cheryl Willis Patten, 22 Oct. 2014. 12 1870 U.S. census, population schedules. NARA microfilm publication M593, 1,761 rolls. Washington, D.C.: National Archives and Records Administration, n.d.
13 James, The Cleveland Genealogy, II: 1710. 14 Coburn, Skowhegan on the Kennebec, 1:178. 15 Coburn, Skowhegan on the Kennebec, 1:178. Hattie Berryman Pitts (b. July 1876 in Massachusetts) was the wife of William (Willie) H. Pitts. Both residents of Skowhegan, they were married on 29 Sept. 1894. Their first child, Harry W. Pitts, was born in March of 1896. Their second child was a stillborn premature male infant who was born in March of 1902. These boys appear to be the only children born to them. Hattie's sister, Nellie, married Mark W. Savage in 1896 and the Savage home on Skowhegan's Alder Street and the Pitts home on the Middle Road, then sometimes known as the Waterville Road, were only a few miles from each other. William and Hattie lived on a farm with William H.'s parents, William A. and Sarah E. (Snow) Pitts. In Skowhegan Harry W. attended schools in the village district and in 1909 was planning on entering “Academy Grammar School, Grade VIII. He was universally popular with his school mates”  and Harry's death on 13 July 1909 “was a tragic circumstance [that] has attracted more than the usual amount of attention and sympathy.”  A Friday July 16th article in the Bangor Daily News claimed that Harry died of “blood poison” , but according to his death certificate Harry W. Pitts died on 13 July 1909 of “traumatic tetanus from injuries received from [a] toy pistol”. On September 29, 1909 an order was placed at the Skowhegan Marble Works for a gravestone for Harry. Mr. Wm. 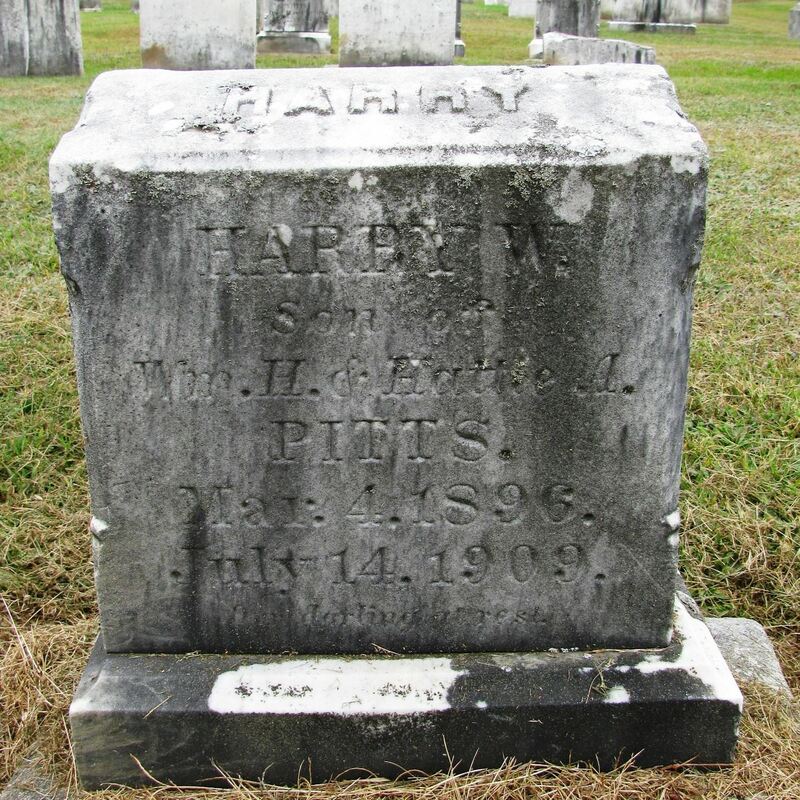 H. Pitts paid $26.00 for Harry's stone  which was placed in lot 557 at Southside Cemetery in Skowhegan . About two years later, on 3 October 1911, an order was placed for a stone of similar shape to be set in the same lot. The 1911 order was to be charged to Wm A. Pitts and the $38.00 was for a marker for the grave of Harry's father, 35 yr old William H. Pitts (b. 10 March 1875-24, May 1910). Father and son now rest side by side in lot 557 in Southside Cemetery in Skowhegan. “Death of Harry Pitts”, Somerset Reporter (Skowhegan, Maine) 15 July 1909, p. 1. column 3rd; Skowhegan Free Public Library. “Death of Harry Pitts”, previously cited. “The Fatal Fourth”, Bangor Daily News (Bangor, Maine) 16 July 1909, p. 12, column 2nd; Maine State Library. “Town and Vicinity”. Somerset Reporter (Skowhegan, Maine) 15 July 1909, p. 8. column 2nd; Skowhegan Free Public Library. Maine Old Cemetery Association, The Marble Records, “Harry Pitts” (No place, privately published, 2006). Volume 74, Page 82. Town of Skowhegan [Maine] Cemetery Information, Town of Skowhegan, online. These words, from the obituary for Albert V. Partridge, as printed on 17 July 1901 on the front page of the Lowell Sun newspaper mark the end of the career of a man who lived an interesting life. He was the son of Benjamin and Hannah Ames Partridge, and was born 5 October 1843 in Prospect, Maine. In August of 1865 he married Emma (1844-1873) and in 1875 he married Martha (1840-1914). He died on 15 July 1901 in Lowell, MA. Captain Partridge's cenotaph in Sandy Point Cemetery in Stockton Springs. ME is a “huge polished granite globe erected to the memory of a sea captain. On the globe is a map of the world, showing the various ports visited by Capt. Partridge in his sailing days. To be found are Boston, Valpariso, New Zealand and Liverpool, indicative of the exuberant life Partridge lived”. This seems a fitting reminder of his world wide travels. “Solemn Service at Funeral of A. V. Partridge”, Lowell Sun (Lowell, MA), July 17, 1901, p. 1, Courtesy of Pollard Memorial Library, Reference Section. “Sandy Point Breezes”, Bangor Daily Whig & Courier (Bangor, Maine), Tuesday, August 19, 1890; Issue 196, NEHGS External database. Captain Albert Partridge of Lowell, Mass., proprietors of the Merrimac House, with his family and servant, have come since the last breeze, and are stopping with Mrs. William Perkins. 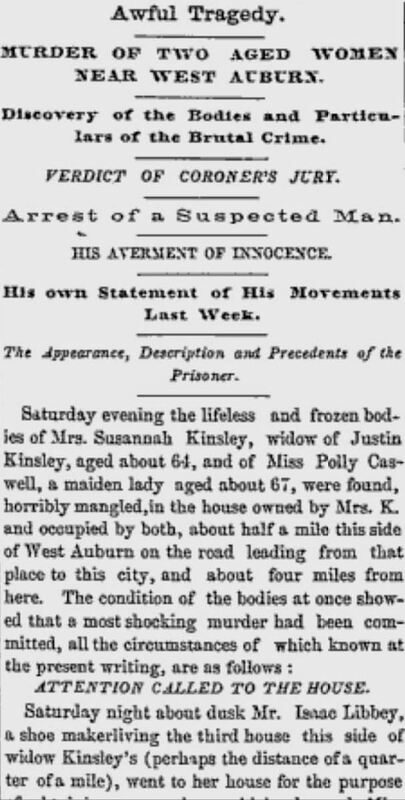 Bangor Daily Whig & Courier, (Bangor, ME), Monday, January 17, 1876; Issue 14; col A, By Telegraph Maine News. “Belfast – 15 Jan Launched from the yard of Henry McGilvery bark Emma L. Partridge [umclear; likely 400] tons, owned principally here and in Stockton, to be commanded by Capt. Albert V. Partridge of Stockton. “Seventy Miles in Open Boats Experience of the Crew of a Bark Wrecked at Sea”, St. Louis Globe-Democrat, (St. Louis, MO) Sunday, October 05, 1879; pg. 14; Issue 137; col C.
 “Unusual Gravestones Are Found in Maine”, Lewiston Evening Journal Magazine Section, October 9, 1976, p. 4A, microfilm Maine State Library.